After a long period where it looked as if the UK was being left out, we now get our second Idol anime in as many months, following MVM’s release of SoniAni Super Sonico: The Animation. 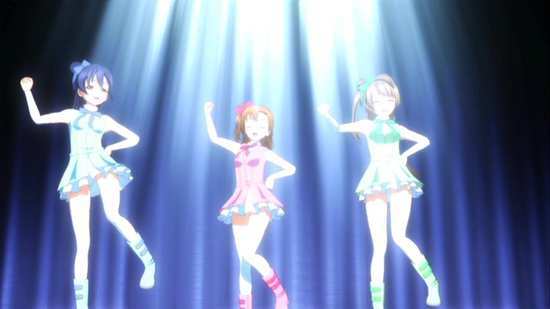 And while that was a little more askew a look at the Japanese pop idol phenomenon, with Love Live! 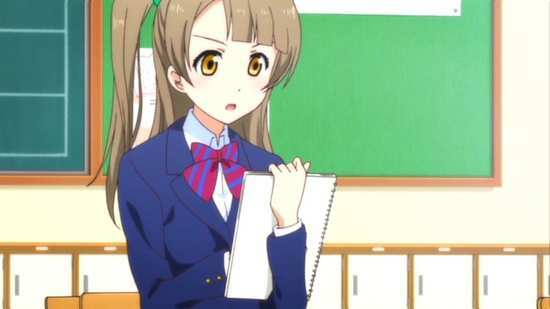 School Idol Project Season 1, we’re going for the full Idol, the phenomenon of fame through popularity and fan obsession to which personality and even talent are secondary concerns. You might wonder why it’s taken so long for us to get the idol genre, but licensing anime is never an easy thing, and it’s only made more complicated by the inclusion of music. 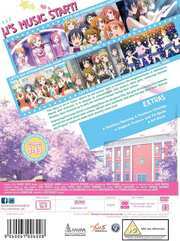 Shows like Eden of the East, and Speedgrapher get their theme songs replaced for Western release, shows like Girls und Panzer have to have songs replaced because of licensing issues, and it’s therefore no surprise that music heavy shows like Beck and K-On also have to have music replaced, although both those titles got lucky in that they lost only one song each. Idol anime are full of music, different songs, maybe even different theme songs for each episode as happened with Super Sonico (you have to sell those soundtrack CDs), and with each show produced by ever expanding committees of animation studios, music studios, sponsors, TV broadcasters, and so on, all of them wanting a say on how the shows are licensed overseas, it’s more of a surprise when a music heavy show gets licensed with its music intact. Fortunately that has happened with Love Live! MVM are also giving Love Live! the premium edition treatment, as are all English speaking territories, but it’s one of those niggling releases where someone will be disappointed. MVM have gone halves with Madman to create the DVDs, although the prominent logo at the head of the disc and at the end of each episode is NISA who licensed and released it in the US. I have only the check discs to look at, so I can’t comment on the packaging or indeed the 28-page softcover colour artbook, although having purchased NISA’s Hanasaku Iroha collections with their hardcover books, they were more than worth the extra expense of a premium edition. The downside for UK Blu-ray owners is that the UK and Australia only get the show on PAL DVD locked to Region 2 or 4. In the US, NISA have released Love Live! on Region A locked Blu-ray only. US fans restricted to DVD will have cause to complain too. Unfathomable marketing decisions to one side, what about the show? 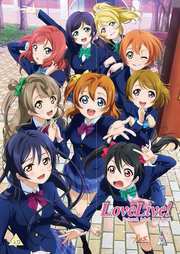 Thirteen episodes of Love Live! School Idol Project Season 1 are presented across 2 DVDs from MVM thus. 1. May Our Dream Come True! 6. Who Is The Center? 8. What I Want To Do! Love Live! School Idol Project gets a 1.78:1 anamorphic transfer on these two dual layer discs, authored by Madman Entertainment in Australia. It’s native PAL of course, with the slight annoyance of 4% speed-up, but the image is clear and sharp throughout, with strong colours, and a bright and vivid aesthetic to the character and world designs. In terms of design style, it’s pretty standard anime fare, but the quality of the animation is detailed and expressive, and the characters are all individual and memorable in their own right, perfect for the fan that will latch onto their favourites, and buy all the tie-in merchandise. This is one show that will switch from 2D traditional to 3D CGI cel-shaded for the music videos, the same way that Super Sonico handled its music video sequences, to better animate the complex choreography of the dance moves, although in terms of maintaining character consistency when it comes to facial features, Super Sonico does it a little better. There is a small issue with this release, that of second long pauses in some of the episodes, where the screen goes silent and black. There’s nothing missing from the episodes (I checked against the Crunchyroll streams), it’s just a random pause in the playback. I queried MVM who passed on the question to the disc authors Madman, and it turns out that this was where the adverts were supposed to go, and they had to use the masters for the show as supplied by Bandai Visual. It’s probably from an online stream, as for episode 4 in particular, the advert pause is in a really dumb place, smack in the middle of a conversation, character line, pause, character line. These are separate from the black pauses that were right after the eyecatches by the way, as annoying as they are, they are in the right place. Once again, I should reiterate that nothing is missing from the episodes. Love Live! is a subtitle only release, and the only audio track is a DD 2.0 Stereo Japanese one. The dialogue is clear throughout, and more importantly the music comes across with its toe-tapping catchiness, not particularly affected by the PAL speed-up on these discs. If there is an issue, it’s with the subtitling, which while it is accurately timed and free of typographical error, comes a cropper in the formatting department. This is one of those title where everything is translated, song lyrics, dialogue, and screen captions, but everything appears at the bottom of the screen. Normally this isn’t a problem, but when there is a lot of dialogue, two conversations translated simultaneously, or dialogue against song lyrics, with screen captions thrown in, it gets very confusing. Especially as in heavily subtitled scenes, there are as many as four lines to read at the bottom of the screen, and Madman opts to add each new line to the top of the list, knocking the previous lines down one row. There are times where it looks like subtitles are scrolling down the screen. This is one show where you will be using your pause button quite often, which isn’t what you want to do during a song. The discs present their content with static menus. As mentioned, I didn’t get to see the packaging for this title, nor the artbook that comes with it, just silver screener discs. All of the extras are on disc 2, and amount to the ‘textless’ opening and three ‘textless’ closings (rendered less than textless by player forced subtitles). You get two of the original TV spots running to 31 seconds, and 5:09 worth of original trailers for the show. I’ve seen this before. A school threatened with closure, and an after school club coming to its rescue by excelling in their particular discipline. And quite honestly I prefer the version that’s set on a giant aircraft carrier and with all the tanks. Facetiousness aside, Love Live! is very enjoyable, a likeable light comedy with a fair bit of catchy pop music to it, and a cast of individual and again, very pleasant characters. It is one of those shows that are engineered and micro-metered to play to its target demographic. Each of its nine main characters are all unique, well-designed, and individual enough for obsessive fans to choose their favourites, developing faux relationships with their idol of choice. In that respect it’s no different from any real-world idol group in Japan. The only real nitpick that I have with the show is its similarity to K-On! It’s not the story, as Love Live! actually has a story, whereas K-On! is more slice of life. It’s the character of Umi, Honoka’s friend, who feels like a direct lift of Mio from K-On! She’s tall, with straight black hair, has the most mature voice of the nine, and is consequently the emotionally mature one in the group, and she gets stage fright and is easily spooked despite her mature outlook. It’s a wonder she’s not left handed and plays bass guitar! The difference from Girls Und Panzer here is that it isn’t the student council initiating things and Honoka reluctant, it’s the other way around. When the news gets out that the school is in danger of closing due to a lack of new applications, Honoka looks around for ideas for what will put their school back on the map (this is one of those unreal high school anime where students all love their high school lives), and comes up with the latest universal craze, that of school idols, which combines the Japanese love of pop idols with the ubiquity of girls’ high schools. The popular schools all have their select high school girl groups, and if Honoka starts her own group at Otonokizaka, fans will want to come to their school, and it won’t have to close. 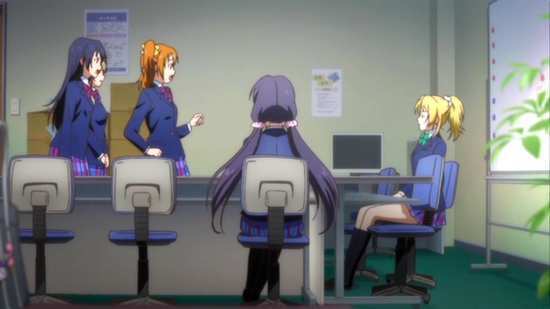 But while Honoka is eager, and gets her best friends Umi and Kotori to help her, the student council president is reluctant, hoping to find another, better way of keeping the school open. 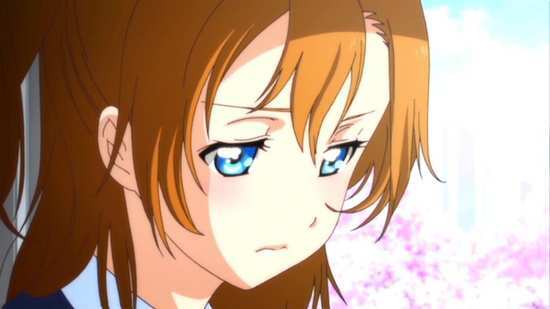 So Honoka has to overcome that challenge, as well as eventually get good enough to enter the Love Live! 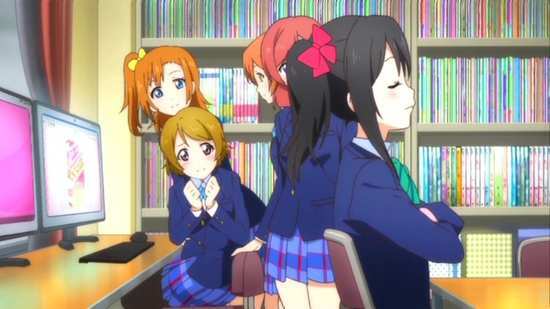 school idol tournament in order to succeed. 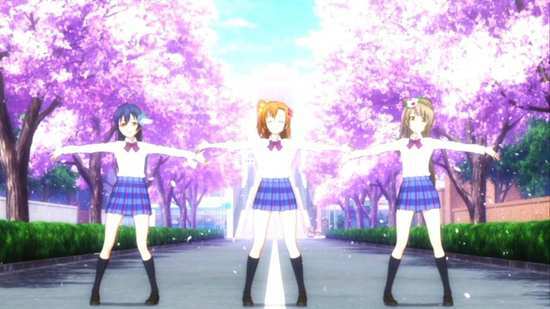 It has to be accomplished in stages, prove that they are good enough to deserve a chance, prove that they have the talent, the skill and the hard work, start an official school idol club, seemingly impossible when there is already an Idol Study club and eventually convince the student council president that they are worth taking a chance on. The way the show is structured makes it very easy to get into. Nine central characters would be an overload at first, but the group actually grows over the episodes, despite introducing all nine characters early on. 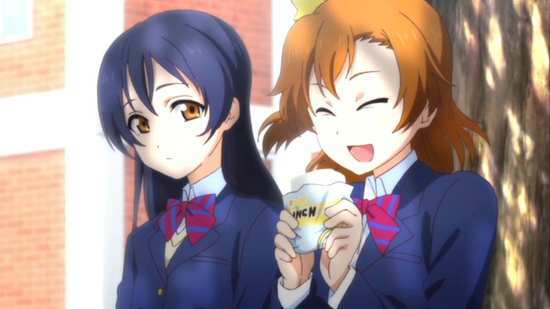 Honoka is the eager young force of nature that comes up with the idea, and Umi is the mature-level headed friend and Kotori the likeable, easy-going friend that she ropes into starting the idol group. 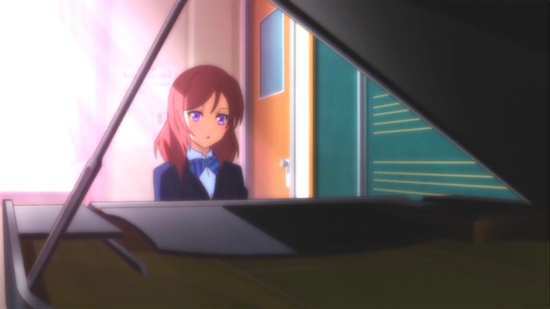 When it becomes clear that they need actual songs to sing, they find a first year girl named Maki who’s actually a musician, although she’s the reluctant stand-offish one. 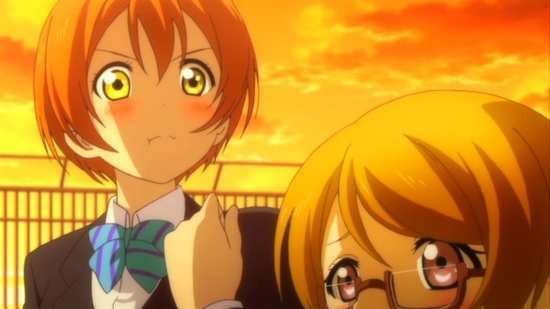 With her come two more first years, the shy wannabe idol Kayo, and her outspoken friend Rin. Then there’s the pushy ‘failed’ idol Nico, who previously started a group, but because of her obsessive nature, wound up alone in the Idol Study club. But her obsessive desire to be an Idol is just what Honoka’s group needs. 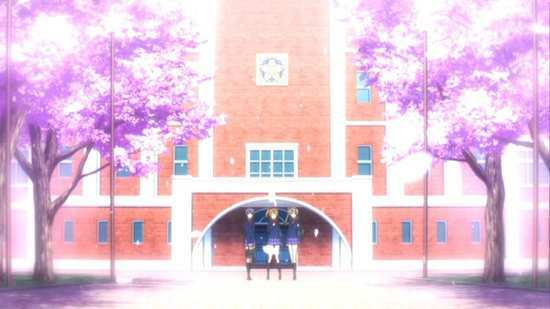 With this seven in place it isn’t long before Honoka convinces the student council president that they are worth a shot, and the perfectionist Elichika even joins. With her comes vice-president Nozomi, the wise (and slightly sly) one of the group, who has been clandestinely helping the idol group all along. 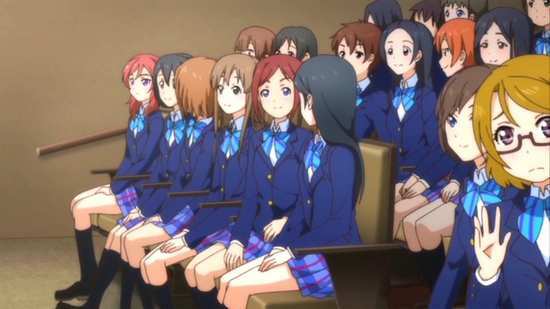 That I could name all of the characters, and point out their personality quirks, without once referring to the notes that I took while watching the show, indicates just how well Love Live! succeeds in developing its cast, and making each of them memorable, distinctive, and to some degree likeable. 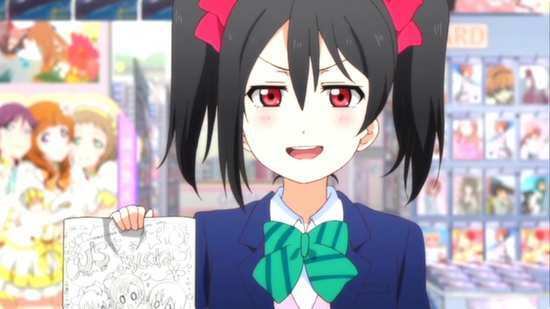 Although I have to admit that if I never hear “Nico-nico-ni!” again, it will be too soon. But Love Live! is a wholly entertaining character comedy, which works on the way the girls interact and bounce off each other. It is your typical anime in that there’s plenty of cutesy fan service, a swimsuit episode, and even some blatant booby grabbing. It knows exactly which target demographic it’s aiming at. But it is genuinely funny, wholly light, and enjoyably frivolous, except for the last few episodes, where a little bit of drama occurs, the series of reversals that ever so briefly threatens this growing and blossoming nine-way friendship, before good vibes overcome all. It has its weak points though and it’s not a show that you want to think too much about. I did, and got distracted by the question of where they get all their professionally produced music from; I doubt somehow that Maki does it all. But Love Live! will entertain for 13 episodes, and it’s good enough to warrant a second season, as well as a feature film spin-off. Hopefully those too will make it to the UK. The show is good, but the quality of the authoring could be better, both in terms of the black screen pauses, and the confusing subtitling, but neither are a significant detriment to the enjoyment of the show.